Trees have a root system that mimic the size of the tree canopy and therefore require a water-permeable surface around their base to access sufficient water. 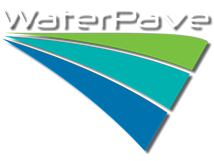 WaterPave provides a continuous porous paving solution that will allow the rain water to penetrate to the roots below, reducing flooding and surface puddles, and eliminating the risk of tree roots destroying the surface. Tree pits, as they are often referred to, allow sufficient rainwater to seep into the subsurface, while providing a solid continuous surface for foot and vehicle traffic. WaterPave tree pits can be installed into paths to offer a durable, permeable solution for trees in any street-scape environment. The DriveCon system can be used for Tree Pits where a permeable surface surrounding the base of trees is required. This single pour method is the more cost effective solution of our two Tree Pit systems, and can be completed with a choice of 36 colours. The City of Melbourne commissioned WaterPave Australia to install their engineered porous paving system to complement their street-scaping in the CBD. These tree pits allow rainwater to seep into the subsurface, reducing the impact of erosion while enabling constant watering to the already established root systems.